Here in the first part of a two-part interview, Shirli describes her career with the organization and the work that it is doing in Israel. She also discusses the Scholarship Fund, which was initiated 40 years ago by NA’AMAT USA and has since benefitted thousands of young Israeli women. NA’AMAT USA: How long have you been working with NA’AMAT? SHIRLI SHAVIT: I’ve been involved in NA’AMAT for about 30 years. I grew up in a Labor household. The National Labor Federation (Histadrut) was part of my life. I knew about NA’AMAT from a young age, and I admired what they did very much. I thought the status of women was a very important issue for Israeli society. The work NA’AMAT was doing to help women, children and families was something that I wanted to be involved in. I wanted to do my part to help. When I was a student at Hebrew University, I worked part-time for NA’AMAT. I served as a lobbyist to the Knesset from 1983 to 1988, promoting issues at the legislative level and getting in touch with members of parliament about bills important to NA’AMAT. After that, for about ten years, I worked in other places, while continuing to volunteer for NA’AMAT. NA’AMAT USA: What is your role today? 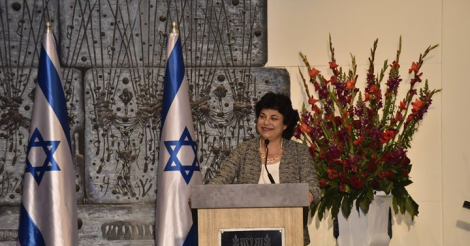 SHIRLI SHAVIT: Since 1998, I am Director of the International Department and the NA’AMAT Scholarship Fund. I’ve held this role for 17 years. I am in constant contact with leaders of NA’AMAT in the Diaspora. I keep them informed regarding mutual projects, fundraising, and all the work being done by NA’AMAT Israel: our programs, campaigns, legislative initiatives and other activities. I’m also responsible for our leadership seminars. Every year, we conduct a seminar or two from a different country. The countries send 15 to 20 women who are potential leaders. The seminars last about 10 days and they give these women an opportunity to learn what NA’AMAT in Israel is all about, and to motivate them for their future leadership roles. Also, every year in the summer, NA’AMAT holds an international meeting for the presidents of NA’AMAT from around the world. We meet for two days and discuss our programs and the future of NA’AMAT. We get reports from all the countries. We get a lot of visitors from abroad, not necessarily Jewish, who come to learn about NA’AMAT and the services we provide. Last year, for International Women’s Day, we hosted a delegation of 30 diplomats from all over the world. We took them to our installations and we had interesting discussions about how NA’AMAT promotes the status of women in Israel. NA’AMAT USA: You were closely involved in the International Solidarity Conference that was held in Israel this past February. Were you happy with the results? SHIRLI SHAVIT: Yes! It was the first time we had held such a conference in 30 years. It was attended by close to 120 members from eight countries. We proved that we are a strong world movement. We visited different NA’AMAT installations. We attended groundbreaking ceremonies for new day care centers in Beersheba and Karmiel, and other special ceremonies. We were guests in the home of the President of Israel, Mr. Rivlin. It was a great experience, very meaningful and motivating for everyone who participated. NA’AMAT USA: You are very proud of NA’AMAT’s Scholarship Fund. Can you tell us about it? SHIRLI SHAVIT: NA’AMAT’s Scholarship Fund was established about 40 years ago by NA’AMAT USA. Every year, we grant 180 scholarships to women studying for their bachelor’s or master’s degrees. Each scholarship is for about $550.00. Thousands of young women have benefitted from these scholarships. We offer scholarships to women involved in all areas of study—law, political science, humanities, social work—but we give preference to those studying science: biology, medicine, chemistry, physics and engineering. One of the problems in the labor market in Israel is that there are so few women in scientific fields. There are many women doctors, although not so many who are heads of departments, and there are quite few women engineers. We want to encourage women to pursue high tech careers. We also award eight annual research grants to PhD students. Each grant is for about $2,600.00. We give four grants for students focused on gender issues: the status of women, equality between the sexes and similar issues. We also award four research grants for women in science – biotechnology, engineering, etc. One of our grant recipients last year was a 32-year-old woman who was pursuing a PhD in bio-technology. She was studying tissue engineering. She is trying to develop ways of treating heart defects caused by heart attacks in order to prevent second heart attacks from happening. Her goal is to develop a functional substitute for damaged tissue and organs. We were very proud to support her work through a research grant. She spoke to delegates at our recent Solidarity Conference telling them about her research and thanking them for their help. We receive hundreds of applications for our scholarships and research grants. Our goal is to promote higher education for women. We believe that education is essential to success in work and life. NA’AMAT USA: So the scholarships make a significant difference to these young women? SHIRLI SHAVIT: Yes. And it not only helps them as individuals, it also benefits society. I tell my haverot that NA’AMAT is really making a difference in the lives of young women. Every year in June, we have graduation ceremonies. Students come with their parents. It’s inspiring to see how enthusiastic they are about changing the world. We catch these young women at the beginning of their lives. We help them achieve better lives and society also improves. Personally, that’s what gives me the strength to continue doing what I’m doing.